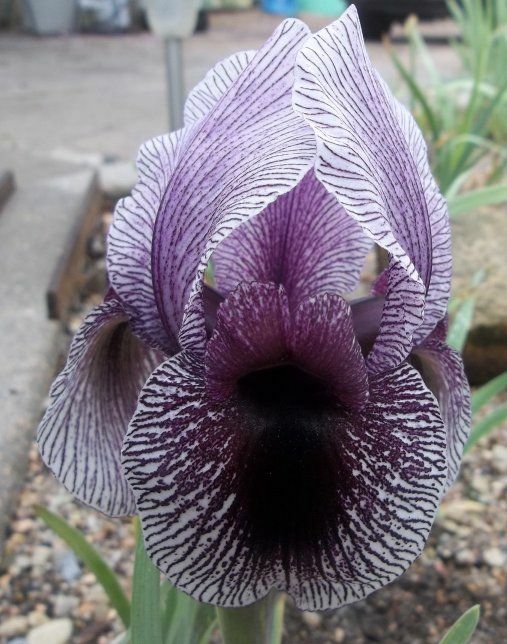 From Supplement To The Comprehensive Checklist of Aril and Arilbred Iris by Sharon McAllister, April 2000: ANDROMACHE AR (C. G. Van Tubergen, BRS). Sdlg #, code, height, and bloom season NIA. L korolkowii X I bamumae subsp. mariae. AIS Color Class: SID (dark blue-tonedsqualens). No description in '76 CL. Court of lris: "Silver bloom with dotting and veining of wine-red. Signal." Rainbow: "VE to E-18". Silvery white and violet, with a soft lilac veil. Heavy decorative veining. Signal patch claret-black, very prominent, like an Onco. Style crests wine-red." Valette: "silvery white, rounded, onco-type flowers, netted violet and shaded lilac; black and wine signal patch". Van Tubergen, 1915. Notes: Name approved; Mathew does not classify this, but I bamumae subsp. mariae was considered a synonym for I mariae in the '76 system; counted as a 21-chromsome diploid, an RC under both systems.Ref: AIS '39, p. 95; ASI '76, p. 10.